I always knew I wanted to spend time overseas and when the opportunity for an elective placement was discussed at university, a few of my friends and I began researching organisations to help us plan our trip. We did some independent research and Work the World was very prominent online. The website included stories, photos, videos and more, and gave us all the information we needed. Even before we made the decision to book the trip, Work the World staff were easily contactable to give us more tailored information and answer any of our questions. After taking the big leap and booking to travel to Ghana, the ‘MyTrip’ tool was really useful. The website gives you a countdown to your departure date and sets you goals of what you need to achieve and by when. Before I knew it, the day had come and I was jetting off to Ghana, thankfully, fully prepared! On the day we arrived in Accra, the lovely Assistant Programme Manager greeted us before providing a super smooth transfer from Accra to Takoradi. Upon arriving in Takoradi we were introduced to all the overseas staff and their roles and they are genuinely the nicest, hardest working people I have ever met. The Programme Manager introduced us to all the different aspects of Ghana in the first few days as part of the induction. Guards provide 24-hour protection at the house and are always there to greet you and even have a pleasant chat when you leave or come back from placement. The cooks prepare the most delicious food and are able to cater for everyone. Additionally, we even had a ‘go-to-man’ for pretty much anything we needed. After being introduced to the staff we were given a tour of the wonderful Work the World house. The house has everything you need for a comfortable stay. The large communal areas, such as the living room, dining room and balcony are brilliant and you get to know fellow students really quickly. The placements are really well organised and you are eased in slowly with a thorough introduction at the start of the week. How much patient interaction you get is up to your supervisor to determine. The team of staff really appreciate if you learn and speak some basic Fante, so its advisable to take full advantage of the Fante lessons that are taught in the house once a week. The placement has been extremely interesting. Midwifery in Ghana is very different to the UK and practices are such a contrast. Although this can be difficult to watch at times, it has made me forever grateful for the evidence-based practice we have in the UK and it has also made me aware of how much I have learnt and how much I know through the training I have received. Initially, I suspected the hospitals in Ghana would be under-resourced, but in reality they're not as poorly equipped as I imagined. 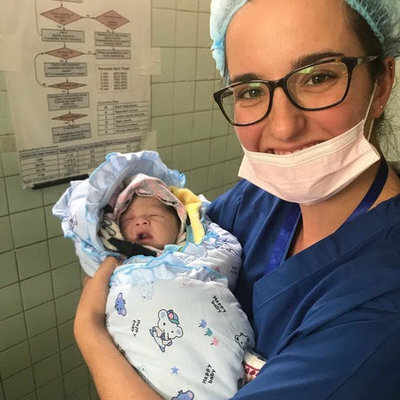 Myself and my friends observed and participated in some situations that would rarely be seen in the UK, some of these include: delivery of the second twin in a breech position, breech twin stillbirth, neonatal resuscitation, and caring for women with malaria, hepatitis B and HIV. I have grown in confidence and experience as a result. I never had this confidence before coming to Ghana but I feel I will be able to transfer this to my practice when I return to the UK. 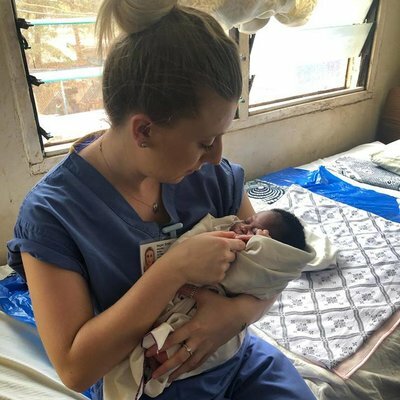 I knew coming to Ghana as a student midwife I wouldn't be able to drastically change the care women and their babies receive, however, I do feel I have made a small change to the women I have cared for and I am happy to say these moments have probably been the proudest of my 3 years of training. I have also learnt how amazing the NHS is and I will be forever grateful for our wonderful NHS! Another major thing I would encourage is to embrace and not fight Ghana’s culture. You aren't coming here to change their practice, you will never change their practice, but you can change your practice for the better. I also chose to spend a week in a remote African village. The village I stayed at is a beautiful fishing village on the coast. Me and my friend from university stayed with a host family who included the village nurses. We stayed in their home, which was attached to the village clinic. We would work in the morning to the early afternoon and care for the people of the village. We saw everything from dog bites to wounds to snake bites and scorpion stings. In the afternoon we had a tour guide called Francis who would plan an afternoon activity such as visiting the palm oil factory or taking us for a tour around the village. Out of the four weeks I was in Ghana this week was probably the most challenging because of the stark contrast to life in the UK. 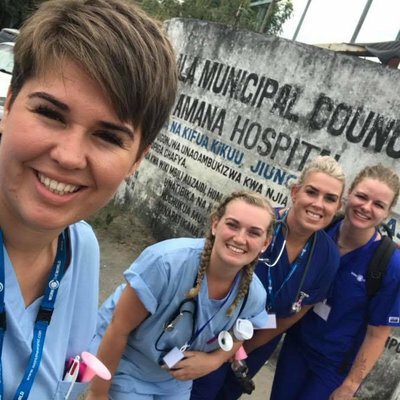 However, I am so glad and proud that I did the Village Healthcare Experience and would recommend it to anyone who fancies a bit of an adventure. After all, there are not many people who can say they have lived and worked in an African village! history of Cape Coast at the beautiful Cape Coast Castle, shopped until I've dropped at local Ghanaian markets, soaked up the sun on an array of different beaches, eaten myself stupid with local food (you can't leave Ghana without trying Red-Red! ), danced the night away with local Ghanaians to traditional African music and experienced the hustle and bustle of the busy city of Accra. Ghana has stolen a little piece of my heart. Everyday I wake up and I think back so fondly on the experiences I had in Ghana thanks to Work the World. I am so glad I have had this wonderful experience and I feel it has made me not only a better practitioner but also a better person. If anyone is thinking about travelling to Ghana with Work the World stop thinking and just do it! Just remember your mosquito net, sleeping bag liner and bum bag and you'll be ready for anything!